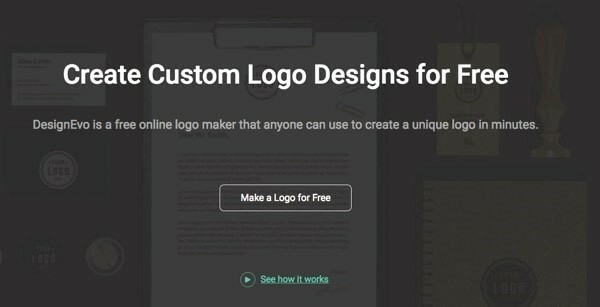 Today I bring you the description of free software that lets you design your logo easily and professionally. A well-designed logo is essential for building marketing and brand recognition, as well as drawing potential customers and inspiring brand loyalty. Usually, you hire a professional to design a logo for you. However, this can definitely be expensive, especially for most small business owners and startups who have a tight budget. Thanks to the PearlMountain, today you can create free custom logos online with the use of their online logo maker – DesignEvo. DesignEvo is a free online logo design application, which gives access to a vast built-in database, offering a large selection of high quality templates, icons and hundreds of stylish fonts for selection. To use it, you do not need any professional design skills, but in just a few minutes you will be able to create your own logo that looks as if you are a professional logo designer. Interestingly, this site does not charge you any usage fees. So you can create as many logos as you want. 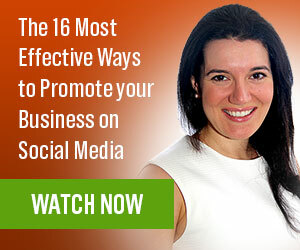 No trial period, no download, and you can create your logo even without registering an account. To start your logo design, open the site: designevo.com and click the Make a Free Logo button. 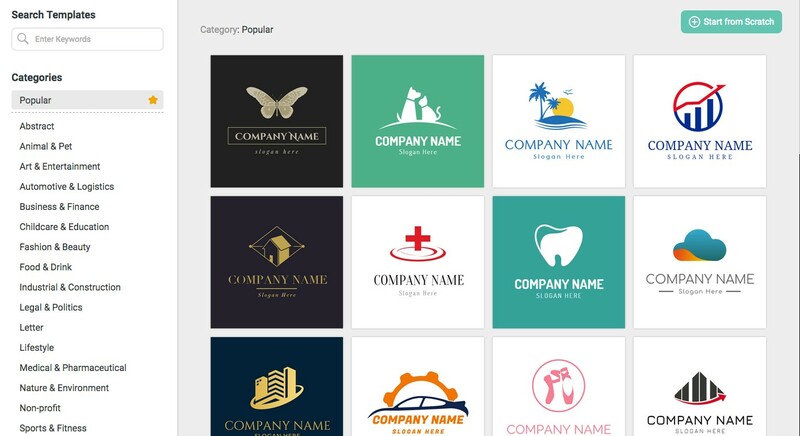 Then the new page lets you choose from a variety of logo samples by the category you want. There are more than 15 categories and 3000 optional templates that you can use as a guide to make it easier for you to design custom logo. For example, you select the company logo design and then a popup dialog box asks you to enter company name and company slogan. You can choose to skip it. 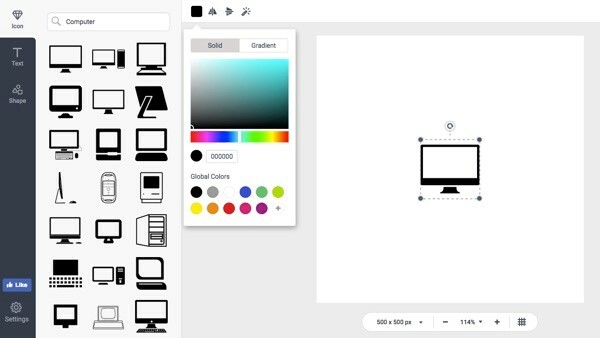 After that, you’ll get an interface that lets you start your logo design process. Here if you want to change the logo you have selected, you can delete any unwanted icons and then choose the desired ones from Icon panel on the DesignEvo interface. To change the font type, you can simply select it under the Text panel. There are various types and attractive font designs that you can choose here. If you need additional shapes, such as lines, triangles, circles or rectangles, you can find them under the Shape panel. Then, if you are satisfied and want to preview the result of your logo, you can click on the Preview button at the top right. 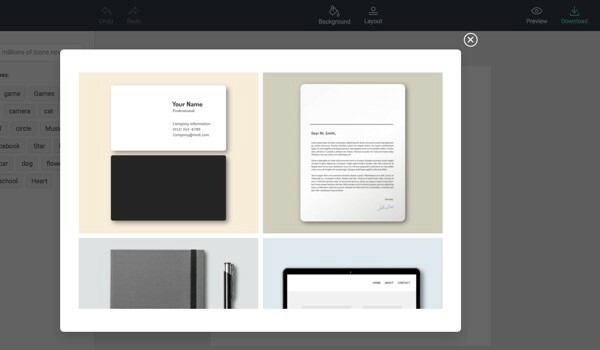 The preview function provides an overview of logo layouts in some places such as shirts, business cards, websites and corporate headlines. 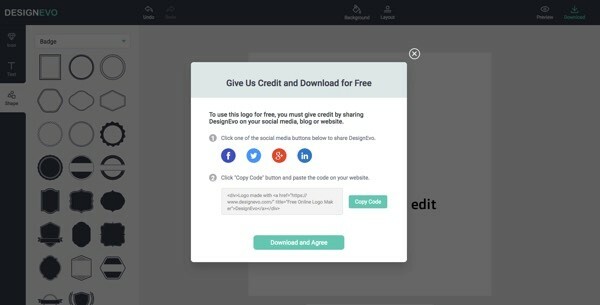 After you have completed your logo, you can download it by clicking on the Download (next to Preview) button, but before you can download the logo, you are asked by DesignEvo to give them credit through your social site or website you have. After that, you can click the Download and Agree button to download the logo you designed earlier without watermarks. What Can You Do With DesignEvo? Looking for a logo for your app, club, shop, blog, website, start-up, company, or any other projects? Whether your business is related to food, education, real estate, social media, fashion, and beauty, etc., DesignEvo gives you creative logo design ideas to create your own style logo, especially if you do not have a budget to hire a designer. 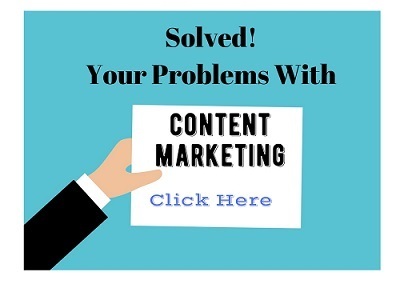 Completely free website with unlimited downloads. No need to download any additional software. Over one million vector icons. A wide variety of fonts and beautiful text styles. Support German, Japanese, Portuguese, French, Spanish and Chinese languages. There are over 3000 well-designed templates where everyone can find inspiration for logo design. You can browse through the different categories or search templates using keywords to find the logo that meets your needs and customize it to make it your own. You can type whatever keyword you want for the icon and it will show any type of icons related to the search. No matter your logo purpose, you will definitely find the right icons available to build your strong brand identity. If there are any changes you wish to return, you can click on the Undo or Redo button located on the DesignEvo interface. Set custom size for your logo. The maximum size allowed is 2000 x 2000 pixels. 1. The format of the logo file provided by DesignEvo only supports PNG and JPEG. It would be great if the SVG, EPS and more formats were available. 2. I can’t save the design and edit it later. DesignEvo is an excellent online logo design site, that’s easy to use by anyone. The interface with a simple toolkit option makes it easy to understand. You do not even need to have previous logo design skills because DesignEvo will make you a great logo designer. Please try it out and let me know what you think about DesignEvo. As someone who does not really know how to make logos or basically just not creative enough, I find these tools really helpful. In the past, I have tried making logos using design softwares, but all that requires some basic training without which it becomes difficult. Later, after I got to know about Canva – life’s a lot better. Will make good use of this tool too as there’s plenty of logos that I have to make for some of my Niche Blogs! I would like to have the save feature like we do on other sites, but then there’s almost no other limitation – which makes this logo maker pretty awesome! I’m glad you liked DesignEvo. I’m another one who isn’t creative, so these design tools are really helpful. Canva is another design tool I have used, so now we have an alternative in DesignEvo. As you get more experienced with DesignEvo, please let me know which you prefer. 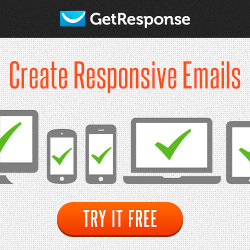 Joy, thanks for sharing this free logo design software! It’s always great to learn about a new app, tool or software that can simplify my workload. I’m going to check out DesignEvo!!! Thanks!! I hope you had chance to try DesignEvo and made some good logo designs more quickly. It’s quite unusual for free software to be as good, so I was pleased to share it. 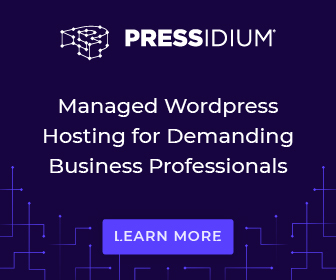 There are lots of websites in the market, which means lots of inefficiency to find a brand, The website logo is a unique one that can be easily identified.